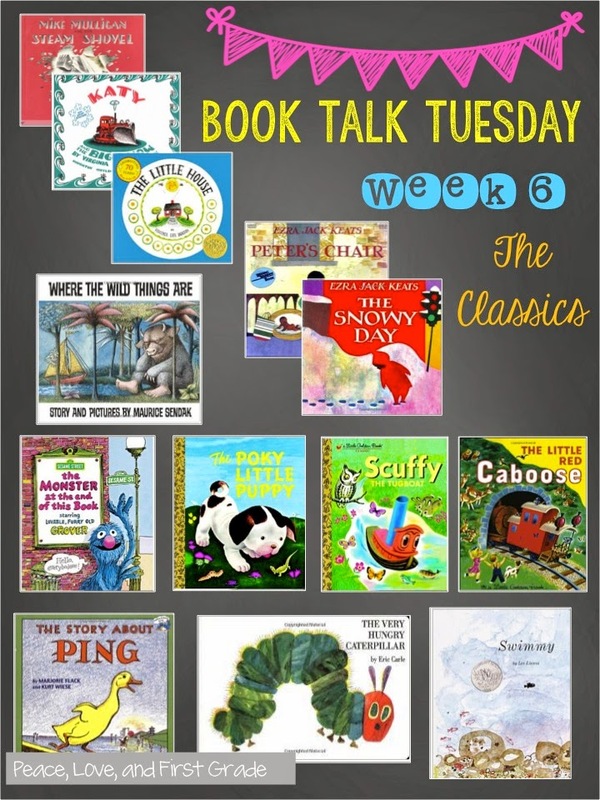 It's Book Talk Tuesday, friends! 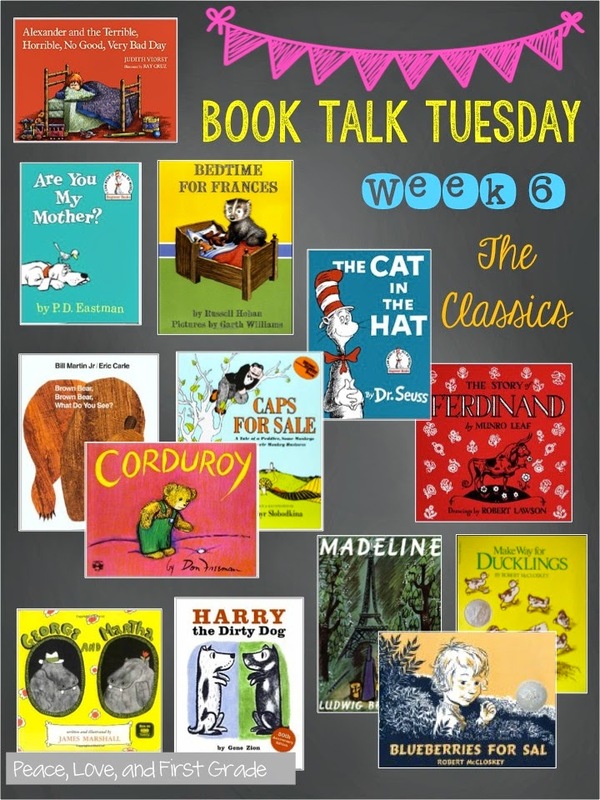 Today, Book Talk is all about the Classics! I had to decide where to draw the line as far as dates go. but I went a little further back-almost 40 years. All the books on this list were written before 1976. Here you go! My list of classics I use with my kiddos! Alexander hit the scene in 1972. He can't catch a break! You just have to feel for him! He knew from the minute he woke, his day was going to be horrible! This book is such a great lead-in to writing. There are several other books about Alexander written after 1976. I wrote about this book last week, but it deserves another post. Written in 1960, this is my hands-down absolute favorite childhood book! The story of a tiny bird searching for his mother. If this is not in your classroom, find a copy now. All of Eastman's books are winners!! Frances, the badger first showed up in 1960. You have to love Frances. She sings! All the time! She fusses with her baby sister and her best friend. She runs away under the dining room table. She's pure fun, and she makes me smile! We read every Frances book in my classroom! Bill Martin, Jr. published Brown Bear in 1967, and today, it's stronger than ever. Perfect book for color recognize and introducing rhyme and repetition. Can't keep it on the shelf! Caps for Sale was written in 1938 and still makes children smile. This is the story of a cap peddler who gets outwitted by some cute and clever monkeys. You know the cat who came to town in 1957. He brought those Things with him and made a mess of the house when Mom was out. The fish in this book is one of my favorite characters. Full of personality! Dr. Seuss belongs in every first grade classroom! waiting to be adopted by a child. Kiddos love sweet Corduroy's adventures. I Love all of Don Freeman's stories! There are several other Corduroy books, as well. Originally published in 1936, Ferdinand is the story of a beloved bull from his days smelling flowers to his big day in the bullfight arena. who have all sorts of adventures! Great for showing children how to resolve differences. There are several books in this series. Harry came to town in 1956, a sweet and funny dog who hates having a bath. Harry has to figure out a way to go back home! the story of a small girl at a boarding school who isn't frightened by much. Little girls everywhere adore this character. This girl included! Published in 1941, this adorable book shares the day in the life of a Mama duck and her ducklings. Precious! and his best friend, steam shovel Mary Ann. Oh, Grover! Growing up, I had a stuffed Grover. This precious book, narrated by my fave, was published in 1971. Yes, it is a Little Golden Book, and yes, it is a classic! Keats published The Snowy Day in 1962. May I just say how much I love Ezra Jack Keats?? If you are into author studies, pick him! Pick him! This book tells the story (in beautiful pictures) of a "snowy day" in the life of a little boy. I can't say enough about this book or Keats! who lives on a boat on the Yangtze river. Don't let the "old" cover turn you off, this one is good! Swimmy made his first appearance in 1963. The story of a little black fish among a school of red fish. Swimmy teaches the other fish about teamwork and perseverance! Love, love, love Lionni's work! Read them all! 1969-Really? I honestly didn't realize this book was so old. because I don't remember hearing it in school. Obviously, this story of a caterpillar who eats too much is a must-have! Sendak published this book in 1963. My teachers knew this one! on an imaginary journey to meet The Wild Things. Most of Sendak's books are classics! Don't miss them! Other Classics you don't need to miss! There are tons of classics out there, friends! I'd love to hear about your favorites! Don't forget to link up with Deanna. All the links here are Amazon affiliate links, but these books are available on other sites, as well.